ORIGIAL POST SEPT 2008; UPDATED July 2017. 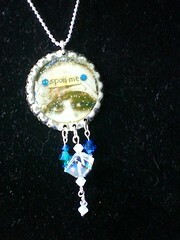 I’ve been playing around with my bottle cap jewelry, and the question of what to put on top has perplexed me. I like Diamond Glaze, but it’s really only good for a thin layer. I wanted something more dimensional and shiny, something more glass-like. I played around with using melted UTEE, but at the thickness I was pouring, I was getting air bubbles and some scorching. Not the right product for the job. Of course, 2-part resin is an option. But resins and epoxies are toxic, and require gloves, goggles and ventilation. I’m teaching in a shop basement, so I’m leery. Enter Magic-Glos by Lisa Pavelka. For those not in the know, Lisa is a talented polymer clay artist, and developed this product for use as a top layer on polymer clay. The big difference between this an other top coats is that it is a UV-curing product. Translation- 10 minutes out in the sun, and it’s cured to a tough, shiny, glass-like finish. Whoopee! And big consideration number two: it’s labeled non-toxic. No gloves, goggles or ventilation hoods necessary! So here’s the poop on using Magic-Glos . I tried it on two applications- in a mold and to fill in my bottle caps, so that’s my frame of reference. I found that it squeezed easily from the bottle (which, by the way, you should store out of direct sunlight) and it flowed smoothly. A few bubbles were introduced, but a quick swipe with a toothpick cleared them out. Now, I live in the northern Ohio area, so sun is “iffy” for us…. but I had a nice sunny afternoon, and the first layer cured handily in about 10 minutes. Wanting a more “domed” look, I added a second layer. I set it out, and it, too, cured in less than 10 minutes- with no cloudiness or inclusions. Really, it looked like a single pour. You can also cure it with a UV lamp- I know that this one works! I had made a few bottlecap pieces using UTEE, and felt like the surface wasn’t up to snuff- so I tried adding a layer of Magic-Glos on top of that. Again, it cured well and bonded with the UTEE underneath. I did notice that the Magic-Glos had a tendency to “pull” away from the sides a bit. It likes to stick to itself, and didn’t want to spread to the edges. I had to add another, thicker coat, but it saved the piece. Hooray! Being my thrifty self, I bought a silicon “star” baking mold at the dollar store, and decided to try that. I squeezed in the Magic-Glos until it was about 1/2 full, and then added some beads to it. I set it out…. but by then the sun was past it’s apex, and the mold was so deep that it wouldn’t cure. So I had to get a mirror and shine the sunlight – stay with me here!- down into the mold. The result was that the TOP of mold cured, (really what would be the bottom once it was inverted) but what was down under the beads was not set up. Makes sense, in hindsight, that because of the beads, the sunlight couldn’t reach to cure it.Hmmmmmm…..
(Note: when I de-molded it, I placed it on an old saucer and tried add some more on the top to “fix” it… it dribbled down the sides and now it is permanently stuck to the saucer. Beware! This stuff has a strong bond!). So next I pulled out my normal resin molds, and tried again. This time, I put a medium thick-ish layer of material in the mold, and let it cure. Then, and added some beads and more product. When it was all cured, I popped it out of the mold, and flipped it back over for a last little sunning…. and viola! That was enough to get it to cure all the way through. My overall impression of Magic-Glos is that it’s easy enough to use, not smelly, not toxic, and therefore pretty much what I want to use in class. It’s pricey at $9.50 a bottle (current pricing is around $7.50 USD) but I got a lot of pieces and experimenting done. It does go a long way. The other drawback is that as far as I know, it’s only available online. Lastly, if you live in a somewhat cloudy area- like me- it may be beneficial to invest in a UV light so that you and cure items inside. I bought the one that Lisa sells on her site- it looks just like the ones in nail salons! Magic-Glos on Nuvo Glitter and Resin Obsession Bezels. Click the photo to see the full tutorial. Polymer Clay & Shrink Plastic coated in Magic-Glos. The image was colored with Copic alcohol markers and not sealed before adding the Magic Glos. Pebeo Bezel with Magic-Glos. For more information on Pebeo Oil Paints, click the photo. So even now, almost 10 years later, I’ve come back to using Magic-Glos as my go-to topcoat. Don’t you love products that stand the test of time? Great review Jenny! I heard the opposite problem happening for people who live in sunny locations like Arizona where there gloss was setting up too fast! I do like the idea of it being non-toxic. And that it is in only one part so it wouldn’t get wasted by mixing too much for a project. I too find it a little pricey however. Shoot, I’m totally sold. Sometimes I want to coat things with UTEE that I don’t think are “bake proof” and this is just the ticket! Though I may be trying a plant-grow bulb, or something, since the sun is so iffy. I was totally impressed with this product ! After letting the bottle sit for a few months I didn’t want to shake it to induce bubbles so I tried it straight out of the bottle. Bad idea – the pour didn’t cure so I ended up warming the bottle and inverting it slowly for 5 minutes. Recoated and the finish took ! YEAH !!! Jewelry was not ruined and this stuff self corrected. How cool is that ? I am in Ct. and do find I have to leave items in the sun for 15 – 20 minutes .The ease of use and self repairing features totally win me over ! Thanks for your comment. You are correct in that Magic Glos pulls toward the center; however, that’s how you get such a nice, domed look with only 1 application. Try using a bit more and that should help that problem. And, yes, it’s pricey– but you cannot compare the cost of a UV curing resin to a water-based glaze. They are just not the same…UV is durable, quick-curing- (7 minutes!) and holds up to water and wear and tear the way a water-based glaze just can’t. Among other UV-Curing resins- like Gel du Soleil by Judikins- it’s actually cheaper! ($9.50 for 1 oz vs. 8.00 for 3/4 oz.) I have used the Faux Dichroic product too– and that dimpling bothers me, and it reacts by clouding when exposed to water (like other water-based products.) So– this is not a paid endorsement, folks– Magic Gloss is still the winner among UV curing resins! I have been looking for something to use to make pendants. Iâ€™m impressed with the Magic Glos reviews. Jenny, your review helped immensely! Thank you. It seems to be the product Iâ€™ve been looking for. I havenâ€™t tried any yet. One question – I have a full time job and do much of my jewelry making in the evenings. Will the product cure at all without sunlight? If not, is it possible to set items on the window sill for curing the next day? It needs UV light- which is in sunlight, or commercially available curing lamps…like the ones you see at the nail salon! 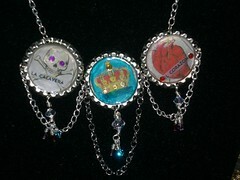 They can be purchased on Lisa Pavelka’s site, http://www.coveredinclay.com, or on e-bay. The product will stay a liquid, and uncured, until the UV rays cure it. You could sit it out on the window sill…but I’d worry about dust or hair particles settling on the gooey surface and then getting stuck in there forever!! I’d spring the 30 bucks for the lamp. I did, and it solves the issue perfectly! Hooray for us night owls…! I’d like to ask: what is the approach for damming or molding with the glos inside? In other words…what does it NOT stick to? I’m sure it sticks to paper like mad, but what about waxed paper? What else does it not stick to? My idea is a bottomless mold set on paper, pour the Glos in, cure, “remove” the mold and you have a stand-alone shape with outside walls (as opposed to a dome) with built-up-edges and adhered to the paper below. I’ve been thinking of getting into resin jewerly, but have been concerned with the safety issues (fumes, etc.). It looks like Magic-Glos is what I’ve been waiting for. Can I use an “Ottlite” like they sell at Hobby Lobby to cure it? Jim, thanks for your comment. Unfortunately, you cannot use an Ottlite. You must use a full-spectrum UV light, such as the ones that are found in beauty-supply shops for nails. (really!) Or for more money you can buy the ones from the travel-supply shops that disinfect. (Also UV lights.) And there’s always the good old SUN! Be careful when thinking about Magic-Glos for resin-type pours; keep in mind that the resin must be cured by LIGHT- therefore if there are large inclusions in the material it will block the light and ergo not cure all the way through. It’s best application is for layering on top of items or shallow pieces (like bottle caps.) If you do go more than 1/4 inch deep, I’d suggest doing so in thinner layers and multiple cures, if that makes sense. Good luck. I’d love to see what you make with it and your experiences with the product. Good luck and happy crafting. Good luck experimenting, and get back to me- I’ll post your results & pics, if you have them! Elena- I’m wondering if you light bulbs are OK in your lamp. It sounds like you might need replacements. (I haven’t heard anything about humidity affecting UV resins.) Try setting your pieces in the sun for 30 minutes and see if that fixes the problem. If it cures, you know it’s not the product, it’s your lightbulbs! Try ICE Resin for a non-toxic, totally crystal clear curing resin option. It’s amazing. ONLY downside, takes 72 hours to cure. However, it will set with or without sun (so your basement shop is a-ok.) Hope this helps! hello! in attempting bottle cap art, i’m about to purchase a collage sheet to print and use in the bottle caps. and of course i’ve read mod podge/glue is an absolute must before pouring resin(s) to protect the paper image. although i have not made the comparison yet, can anyone tell me if the “store bought” bottle caps are the same depth as one you would pop off a soda pop bottle? regardless, how many pours could it take to get a nice “domed” effect? First- the “blank” bottlecaps you buy are the same depth as the ones you pry off your Heineken. BUT, the blanks are in pristine shape- no dents on the cap. However, you still have to remove the rubber gasket on the inside, no matter which kind you buy. Second- Magic gloss needs direct sunlight, but you can tent it will a glass baking dish to keep out the air-born goobies. Third- MG will dome slightly on the first pour. As you may have read in the review, the tendency is for it to pull in toward the center- unlike 2-pt resins, that need 2 pours to get a dome. It’s not a super-high one with MG, but it’s one step and takes only 20 minutes. Winner! I love the magic glos but need help on how to get the bubbles out!! I LOVE THIS STUFF!! The most important thong is DON’T SHAKE THE BOTTLE! If need be, store it upside down before using. Pop bubbles with a pin or toothpick. Hello- and thank you for such a wonderful review! I am too researching the bottle cap craft. With this product, do you need the image on photo paper, or will regular do? AND- does the image need to be sealed before the MG application? AND- to glue the image to the cap, which kind of glue os prefered? I’ve read everything from modge podge to Gorilla glue. Thanks, Jenny, for the great information about using Magic-Glos. We are going to link to this blog on our product listing. Bead Inspirations sells Magic Glos online, and will ship it for free. I am currently making bottle cap magnets with printed images of my original art. Super Glue has left a yellowing on my images with Magic Glos, so now I use Liquid Fusion for gluing to the caps. I have not needed to seal the print outs of my images. You just have to make sure the ink is dry before you start with the Magic Glos. I live in Arizona and do get bubbles because it dries too fast in the sun. Takes 5 seconds to dry. ha ha! I resolved the bubble problem by doing very thin layers. It takes more time but comes out great! I’m trying to use the gloss in bottle caps. I’m printing images from the computer onto card stock paper. The gloss keeps “bleeding” into my images — giving a wet look to the paper. Any suggestions to get an original under the gloss? ps. your samples look great! I’m a little confused as to which is bleeding- the ink on the pages or the gloss? The Magic Glos is good only as a topcoat, and it stays “wet looking” even after it’s cured- that’s the nature of the top coat. If the ink is bleeding, try coating the image front and back with Mod Podge to seal before applying the Magic Glos. I hope this helps! I have get the same “wet paper” look with original artwork on laser-jet paper and on drawing paper. I do my artwork with pencil, so I know it’s not ink bleeding. I’ve tried sealing it first with clear packing taper (recommended on Lisa Pavelka’s site), but the Magic-glos still works it’s way under the tape at least half of the time… very frustrating. It starts on the edges and slowly works it’s way to the center over time (even months), so I know it’s the resin that’s doing it. Besides the “wet” look, when I’m able to remove the Magic-Glos layer it is sticky wherever the Glos touched the artwork, no matter how long I’ve left it under the lamp. Has anyone found an art paper that doesn’t react like this to the Magic-Glos? If the Magic Glos is still sticky, it means that the UV light hasn’t been strong enough to cure the polymers. Is your bulb getting old? Perhaps a new one is in order…. other than than, I can’t really help diagnose the problem without seeing it. Also, I’m not sure what your end product is- maybe it might be better to use a topcoat like Mod Podge Dimensional Magic for non-jewelry items or a 2-part curing epoxy like Ice Resin? I’ve reviewed both on the blog- use the search field to bring those reviews up. Good luck! I recently used Magic-Glos but have been a little disappointed because it seems to have lost the shine after wearing my necklace a few times. The necklace doesn’t rub against anything to have caused this. May try adding another layer to see if it helps. At this point it can’t hurt. Anyone else experience this problem? Jamie- it’s not happened to me, so I can’t really help. Could you have gotten hairspray on it or something? Try a good cleaning first…. I have tried EVERYTHING to seal my art prior to Magi-Glos and it either causes yellowing, seeps into the art, isn’t clear, etc., etc. I have even contacted Lisa Pavelka and apparently they are testing an oil-based spray coating designed for artwork but no final verdict on that. I tried it myself and had problems with the artwork smearing. Has anyone had success with any other products? I am pulling my hair out and have ruined many a bezel with resin that DAYS later has seepage. DO NOT use Modge Podge – it is fine for about a month or two then begins to pull away from the resin. One is water based and the other oil-based. I had some oooey gooey problems too, but I found some great tips from Lisa Pavelkas website that really helped. I also looked everywhere I could think of online and found a few other places that recommended the same tips with good outcomes. Lisa says: Terrific for most paper arts. (Papers and fabrics coated with water-soluble sealers such as decoupage fluid should not be coated with Magic-glos™.) Photographic paper, regular paper and fabric should be sealed to create a waterproof barrier before applying Magic-glos™. Use clear packing tape, transparent shelf liner, laminating film or a coating of liquid polymer clay (Fimo Decorating Gel is recommended. Follow manufacturer’s instructions for heat curing liquid clay). I want to try personalizing with photographic paper next. So far I just use her waterside transfers and they come out great with these tips. 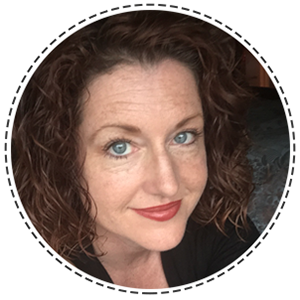 I hope this helps a little…,and thanks Jenny for your awesome site and awesome reviews!!!! I want to cover my handmade wooden jewelry with this resin. Earlier I used epoxy resin, but actually it doesn’t always work – sometimes, I don’t know why, it is still sticky. I just read this review to find out about second coats. I’ve been using Magic Gloss on some polymer clay pieces and it’s great but I cure it with Lisa Pavelka’s Uv light and haven’t had a failure. But today I used it on a few pieces and it has pulled back from one corner of one piece so I feel confident now to do a second coat. Very informative review. Thank you. Just wondering if Magic Glos will stick to wax paper? Would like to try some wire wrapped ideas with resin middles, but don’t know if it will stick to wax paper? I know it sticks to everything else! Anyone have any trials with wax paper? I haven’t tried it, but I highly doubt wax paper will work. However, silicone mat works beautifully- like the Hot Melt Helpers or the Imagine Crafts mat. They have a smooth surface and the resin peels off. You can also use a Sil-pat style mat, like the Ranger Craft Mat, but be aware that there is a fine texture to that mat that WILL show up on the back of your piece if you are are using a window technique. (Such as your wire frames with resin middles.) Also, you can use Packing Tape! Wait until it cures, then remove the tape and use Goo-Gone to remove any residue. Good luck! I know it’s been years since you wrote this but I am curious if you use a mould release spray so that the resin comes out. I have plastic moulds (not silicone) and I tested one piece and it’s in there forever. There is a mold release spray- but I don’t use it as I use silicon molds most of the time. If the plastic mold is flexible, there is a change that the resin will release- but if it’s a hard plastic mold it will just fuse with the resin. Thin, clear plastic molds (like for chocolate) usually don’t work.) Looks like I need to do a post on mold types & uses in the near future!